Home April , CDN , children , crafts , feature , holiday , holidays , homeschool , papercrafts , printables , US , worldwide April 3rd - Featuring 16+ Pony Express Freebies! April 3rd - Featuring 16+ Pony Express Freebies! -- The early coaches of Wells Fargo took twenty days to cross from St. Joseph, Missouri, long considered a great outpost of civilization, to Sacramento. But twenty days to the merchants and bankers of the West Coast seemed an eternity, and so just before the Civil War began, the Pony Express was established. They selected Henry Wallace for the signal honor of inaugurating the Pony Express on April 3, 1860. He made the journey in just 10 days. -- In the eve of the Civil War, three American businessmen launched an audacious plan to create a financial empire by transforming communications across the hostile territory between the nation's two coasts. In the process, they created one of the most enduring icons of the American West: the Pony Express. Equally an improbable success and a business disaster, the Pony Express came and went in just eighteen months, but not before uniting and captivating a nation on the brink of being torn apart. Jim DeFelice's brilliantly entertaining West Like Lightning is the first major history of the Pony Express to put its birth, life, and legacy into the full context of the American story. • Pony Express -- Striking outdoor locations highlight Frank Gruber's story, which details the founding of the Pony Express and how it prevented California from becoming an independent republic. Ruthless killers (Henry Brandon, Stuart Randall) trying to incite a rebellion against the United States, employ devious schemes to prevent Buffalo Bill Cody (Charlton Heston) and Wild Bill Hickok (Forrest Tucker) from getting the Pony Express started. Rhonda Fleming and Michael Moore play siblings who are loyal Californians, violently opposed to the Pony Express and statehood. Directed by Jerry Hopper (The Secret of the Incas). • Pony Express Messenger Badge -- From April 1860 through October 1861, Pony Express messengers carried mail over a hazardous 1,600 mile route. This route took only 10 days to complete. 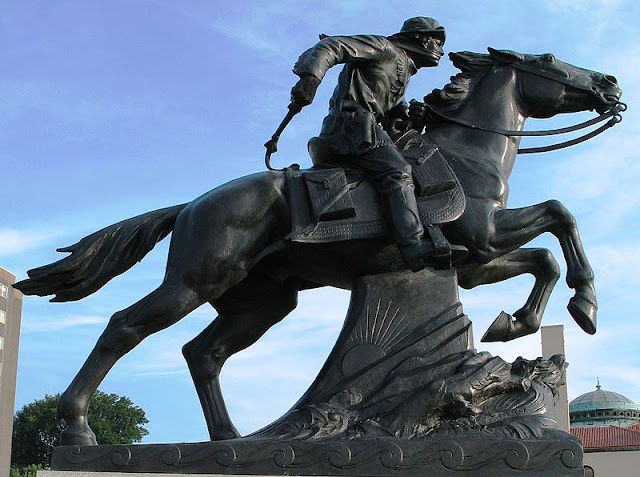 Some of the more known names who rode as Pony Express Messengers were Johnny Fry, John Burnett, Richard Egan, Charlie Cliff, and William Buffalo Bill Cody. -- A holiday birthed from dreamers, free spirits and entrepreneurs. Or maybe it's a bit of spring fever making you want to reconsider sitting at a desk all day and tapping away on a keyboard. If you're truly unhappy with your job, maybe it's time to explore why. It may be time to start considering a more satisfying career. -- This is a day to consider the cost of political corruption. William March Tweed, New York City political boss, whose Tweed Ring stole somewhere between $30 million to $200 million from the city. Tweed was born in New York, NY, on April 3, 1823. He died in his cell at New York's Ludlow Street Jail, Apr 12, 1878. Cartoonist Thomas Nast deserves much credit for Tweed's arrests and convictions. -- Nothing feels more decadent than sitting back with a dish of chocolate mousse just waiting for our enjoyment. The light yet delicious character is something to behold and everything to long for. Today is a great day to indulge in this sinfully wonderful food and maybe thank the French for their creativity. -- Rainbows feel like a gift from nature, enthralling all ages and all nationalities. If it rains today, go outside after it ends and look at the sky. If you are lucky enough, you may just be able to catch a quick glimpse of a rainbow. So take a snapshot of one of these wonderful natural events. -- Isle Royale National Park was established on April 3, 1940, by President Franklin D. Roosevelt, to conserve a prime example of North Woods Wilderness. The park was designated part of the National Wilderness Preservation System in 1976, under the Wilderness Act, and remains today as an example of primitive America. In fact, over 98% of the land in Isle Royale is designated wilderness. -- World Party Day began as a grassroots effort in 1996 and was one of the first global efforts in a growing number of movements of synchronized human celebration to bring about improved social conditions. World Party Day (also P-Day) is observed yearly on April 3rd, through personal and public observances of a party-like atmosphere. A basic premise is the opposite of war is not passive action or peace, but party.